LOOK AT IT THIS WAY-- ONLY ONE DAY LEFT TO BREAK ALL THE RESOLUTIONS YOU MADE A YEAR AGO. I don't have much money but for the New Year I plan to start a quarter swear jar. You guys will be the recipient of the money in the jar. You should do pretty well as I retrain my potty mouth. Maybe some other people would like to try this in the New Year? Take care! THAT WAS NOT EASY 6 PUPS... NOT THE SAME LITTERS... ARGUNG OVER TOYS AND TEHY DID NOT WANT ANY PEOPLE IN THE SHOT... SO WE CRAMMED PAM WAY UP IN TH E CORNER AND MOVED THE CAMERA TO EXCLUDE THAT AREA- AND TRIED TO KEEP TH EPUPS RUNNING AROUND ACTIVE--- THIS INVOLVED VERY QUICKLY PUTTIN G SOME OF THAT BLUE MATTING ON THE RAMPS---- CP-- B HEISS ---GAVE US A ROLL FROM PIG COMPANY - GOOD STUFF. WHILE PEOPLE ARE LEAPING ABOUT TRYING TO GET FILM TOGETEHR FOR THE ABC PRODUCER....GEORGE CALLED CHANGING KRINKLE'S MEDS SLIGHTLY-- MEANWHILE MEGAN GAVE OUT THE MEDS AND FLUIDS YESTERDAY IN GRACE'S ABSENCE... KRINGLE AND GRETCHEN ARE PRETTY MUCH UNCHANGED..... NO RED STOOLS-- THIS IS A GOOD THING.... I NEED TO TALK WITH GEORGE ABOUT GRETCHEN AND THE ANTI VOMI MED. PLUS BAILEY IS LOOKING A BIT FRAIL-- SHE NEEDS SOME SPECIAL ATTENTION.. I THINK HAVING HER TEETH SCALED MAY HAVE SLOWED UP HER EATING-- AND SHE IS LOOKING THIN.. I WAS ABLE TO FEED HER 2 CANS OF FOOD WHILE SHE WAS LYING ON HER SIDE.... BUT SHE TOO NEEDS ATTENTION. SPEAKING OF WAITING DIDI'S OWNER CAME TO PICK HER UP LAST NIGHT-- SHE WAQS BOUNCING GLAD TO SEE HER.... AND WHEN SHE PUT THE HARNESS ON DIDI-- THE TRANSFORMATION WAS IMMEDIATE." I AM THRILLED TO BE BACK TO WORK"
IT IS WONDERFUL TO BE ABLE TO DO IT RIGHT. BLESS YOU ALL--- THE SHATUPON SOCIETY LIVES ON !!! Yes. Carlene, IMO, it's just common sense to think positive about the future for all service dogs, whether once struck down with A Parvo, or injury, whatever within reasonable doubt doesn't have to be the future. My Australian Shepard had a Parvo, treated with active coal (home-based made) and the regular meds in France, at 6 weeks, and is now nearly 10 years old and very healthy all the years. I, knowingly, flew to Normandy and bought her, it wasn't hard to decide after she had recovered. I've never regretted it. Keep up the good common sense, don't reduce the numbers of good service dogs because of what could happen. Future health problems are possible, there's no Crystal Ball. if they have a silent auction setup, we can have a poster about "donate $1 ( or $5 whatever) ad pick a number.... in about 1/2 hour our hens wll pick the new lifetime member of the shatupon society of ipswich" to attract attention to the "booth" we could run a video loop of puppy pictures-- training pictures and a few chicken s on the table-- then at the end ( about 1/2 hour) we run the actuall poo picture and me measuriong it to declare the winner-- who gets a shatupon certificate. In a.m. perky sitting on kuranda barking. In evening sitting on the floor attentive & interactive. Continues w liquid brown stool x7 episodes since last night. Food fleck noted in stools during the day. Voiding small amts, 2 witnessed. For breakfast ate 1/4 c. chicken and 1/4 c. puppy kibble. Snack ate 1/4 c. chicken soup puppy food. Dinner - 1/2 c. chicken, nibbled on hamburger. 20 minutes later vomited undigested chicken and puppy kibble. Ate 1/4 c. chicken soup puppy food 1 1/2 hrs later with no g.i.distress noted. I apologize for my delay in writing my update on life with Little Miss Ethel. She and I are doing great, she's my steadfast companion in the long hours of studying for the medical school admissions test. In November she accompanied me to the Paralympic Training Site Lakeshore Foundation in Alabama where I shadowed Dr. Morgan, a Paralympic who leads research on the body mechanics of wheelchair athletes. Ethel loved jogging alongside me on the track as I tried out different racing wheelchairs and got her first taste of real Southern culture as we toured downtown Birmingham. I train for my upcoming triathalons in the pool while its rainy and gross outside with Ethel watching over. She doesn't understand why anyone in their right mind goes willingly into the water and so she gets very excited to brace for me to pull out of the pool when I'm done. After some trial and error, her vet here and I figured out that some of Ethel's skin issues (hair falling off of her paws and blistering) was caused by an allergy to chicken proteins. Unfortunately, chicken fillers are used in a lot of processed dog food/treats but she's frolicking with a shiny coat now that she's on Purina Salmon. I'm proud of say that Ethel is also on the lowest dose of steroids she can be on from her blood disease from last February. If her next blood test (next week) comes back with a strong platelet count, then Ethel can be off steroids completely. With the decreasing steroids came a decrease in weight and she's back to her original size of 120lbs. (Although I assured her she never stopped being the most beautiful service dog in the world). There's not much else to report on this end, we had a wonderful Christmas and Ethel got to tear apart all her new stuffed animal friends with a wagging tail. She has been and will always continue to be the best gift I could ever wish. Thank you Carlene and thank you all of SDP! WE DO HAVE A NEW ONE... GRETCHEN-- JUST STARTING TO GET SICK-- NOT EATING RAISED TEMP 103.2 -- AND I EXPECT TO GO THRU THE SAME CYCLE AS THE REST... FLUIDS... ANTIBIOTICS...SO BE PREPARED-- ONLY OTHER HEALTH PROBLEM IS LINT-- FROM WEEKS AGO... STILL OCASSIONALLYHAS A STRANGE NOISE WHEN BREATHING... NOT ALWAYS.. BUT WE MAY DECIDE TO TAKE HER IN FOR XRAYS...OTHERWISE SHE SEEMS FINE. JUST NOISY... *****MY PHILOSOPHY ON MUCH OF THIS MEDICAL TESTING IS... WILL THE TEST MAKE ANY DIFFERENCE IN MY TREATMENT OF THE ANIMAL ( OR PERSON)??? BEING ABLE TO ATTACH A LATIN NAME TO SOME ALIMENT ABOUT WHICH YOU CAN DO NOTHING ANYWAY, CLASSIC CASE....MY FOOT-----, IT HAD BEEN SLIGHTLY SORE , BUT NOT SLOWING ME UP.. SO I IGNORED IT FOR A WHILE.. BUT THEN THERE WAS A QUESTION OF A METAL FRAGMENT IN MY FOOT WHICH WOULD BE A DISASTER IN AN MRI.... AN XRAY DISCOVERED NO FRAGMENT , BUT A BROKEN BONE-- THE DOCTORS WANTED TO PUT A BIG CAST ON MY FOOT- WHICH MEDICARE WOULD PAY FOR, BUT WOULD HAVE MEANT NO DRIVING AND OTHER INCONVENIENCES... SO I SAID "NO" --I WAS SUBJECT TO ALL KINDS OF VERBAL ABUSE FOR NOT LETTING THE DOCTOR PUT A CAST ON MY FOOT... WHICH I HAD BEEN WALKING ON FOR MONTHS WITHOUT ANY REAL PROBLEM..... *******MY FIRST RODEO...WAS NOT IN 2015, 2012 OR 2006.....OR 1988 FOR THAT MATTER....... I WAS JUST STARTING A NEW FOLDER ON THIS COMPUTER....FOR SAVING BUILDING INFORMATION AND WANDERED THRU SOME OF THE EXISTING "FOLDERS" . I RAN INTO A "SICK PUP" ADVICE --"HAVE YOU WASHED THE V PEN? IT LOOKS DIRTY IF THEY EAT IT THEY WILL GET SICK..."-- RIGHT .. IT IS DIRT-- HOW AM I TO WASH IT? OR STOP THEM FROM EATING IT.??? BOILING DOWN TO ...MICROMANAGMENT---- IF I KEPT THEM ALL IN CRATES- --- KEPT TRACK OF EVERYTHING THAT GOES IN OR OUT OF THEM AND WALKED AROIUND ON A LEASH- THIER PHYSICAL HEALTH COULD BE MADE TO BE OUTSTANDING....HOWEVER I PREFER TO GIVE THEM A LIFE OF RUNNING AS FREE AS POSSIBLE - WHICH HAS IT'S PERILS.. I CAN TRY AND REDUCE THE INCIDENCE OF INJURY OR SICKNESS... BUT WASHING THE "V PEN" OR SCRUBBING PUPPY HILL IS NOT IN THE CARDS.. I TAUGHT MY VERY YOUNG KIDS TO RIDE BICYCLES LONG DISTANCES ( 5 MILES?) BEFORE THERE WAS SUCH A THING AS HELMETS...AS ADULTS THEY NOW RIDE 50-100 MILES HAPPILY ---( WITH A HELMET.).. THERE IS SOME PARALELL... ? A CALCULATED RISK? *************ONE THING I HAVE LEARNED LATELY IS THESE INTERNATIONAL "PASSPORTS" WHICH ACCOMPANY DOGS FROM EUROPE, THEY LIST THE VACINES AND ATTACH THE STICKERS FROM THE VIALS AS WE DO HERE.... THEY PUT THE DATES NEXT TO THE STICKERS.. WHAT I COULD NOT READ IN THE SMALL PRINT WAS THAT THE SECOND DATE WAS NOT THE SECOND STICKER, BUT TH DATE WHICH COVERAGE FROM THE VACINE EXPIRED AND NEED TO BE BOOSTERED.I KNOW IT NOW... AND SO DO ALL OF YOU!! EXPERIENCE COMES FROM BAD EXPERIENCES. *******EVEN THO WE CURRENTLY HAVE 2 NEGATIVE TESTS FOR PARVO. SOMEONE ASKED IF HAVING PARVO ELIMINATED A DOG FROM SERVICE DOGS.... HOW EASILY A RUMOR STARTS- IT IS FRIGHTENING... SYMON HAD A SHOULDER INJURY WHICH MADE HIM A FABULOUS FAILURE- THE FACT THAT HE HAD HAD PARVO HAD NOTHING TO DO WITH IT... BUT THIS WAS ENOUGH FOR A RUMOR TO START.. SO THE DISCUSSION THEN BECAME IF THEY HAD PARVO ARE THEN NOT GOING TO GET IT AGAIN... LIKE MY MOTHER MAKING ME PLAY WITH A FAMILY WHICH HAD THE MEASLES-- AS ALL YOUNG GIRLS OF MY AGE WERE FORCED TO DO....IS A VIRUS A VIRUS THT IS A AUTOMATICLY ADNMINISTERED VACININATON. I HAVE NOT HAD A CHANCE TO CHECK WITH PEOPLE WHO'S OPINION DID OT COME OFF THE INTERNET... THERE MUST BE SCIENTIFIC ANSWER TO THE QUESTION...I DON'T YET KNOW IT. ************Today John and Jess had a busy day. This afternoon John was real tired so he decided to take a nap. He was in a deep sleep when apparently Jess had an urgent need to go out since she had "tankered up" with water not long before their nap. We don't know what she tried to wake up John, but whatever it was wasn't working so she tried something new - she climbed up on the bed and sat down on John's stomach. She was immediately successful and was quickly escorted outside, much to her relief! You told us that Dane's are thinkers. We believe you. Several bouts of reddish brown stool overnight and once in a.m.
No diarrhea since 9:30 a.m. Dark greenish brown diarrhea with mucous blobs during the night. None during the day. Very quiet all day, intermittent fine shivers. Rapidly ate eggs and chopped hamburger in a.m. Vomited an hour later. Quiet but interactive, playful in evening, outside in kennel 5 run for brief play time in a.m. Ate paper bowl full of chicken with broth approx 1 c.
recording what was not there is totally foreign to my way of observing. people with the ability to remember things not visable are astounding to me. i have so much --" if i can not see it, it is non existent." i am looking for floor plans only ----and i have a feeling we need to go slightly wider..
mostly because we can not have a rug covered sleeping loft because we can not clean it..
then--- to stand around and look at it.. the t tent is 20 x 30- and simple to build- i built it years ago... and one post may be sagging, but it has not collapsed even in the 4'snow last year... so the engineering there is proven to work..this building would have to be on a concrete slab-- with drains pre installed..-- so no sag there. but then there might be mounds of snow...etc... it is looking like spring. so we have time to think--floor plan only- on paper..
i don't know how to imbed that kind of thing... but it is around..
maybe i should make a new years resolution and go to the phone store and see if they can get my phone back to only making phone calls- yesterday i somehow had hundreds of pictures some volunteer had posted somewhere...and could not use the phone. and i really don't need my car to tell me every email i get about buying the ultimate home security system... which if i push teh wrong button this siri woman will read teh entire thing to me while causing the windshield wipers to wipe. someone found this for me. DD - Dec 14, 2015 Carlene White's tips for training on the Yuppy Puppy! that lecture about "our dogs don't sit" by bella should have been taped --i can not tell you how many times i have listened to "What do you mean they don't sit?" like their training is deficient...we try and stay with meaningful training--- it is less domineering-- and more educational... rarely do you see any of us marching in circles with a dog "at heel"- ours is a more casual style of what works best. Kingdom Hall for our 1 meeting. Then we got home a little after 3, and watched a little football. It was kind of damp and gloomy so no outside playing. command is a protection for Bella. That was about the excitement of our night. Thanks for looking in on us and have a wonderful night. GEORGE STARTED ANOTHER ANTIBIOTIC FOR KRINGLE...ALONG ITH THE REST.OF THE PILLS AND FLUIDS. .. THE OPTHER 3 PUPS ARE EITHER 3 DAYS BEHIND KRINGLE, OR THEY ARE NOT GOING TO GET IT AS BAD..
NEXT JOB-- TRYAND GET SOME FOOD TOGETHER FOR THE SICK ONES.... A BUFETT OF SCRAMBLED EGGS, YOGURT, SOUPY BLENDED HAMBERGER AND SEE IF ANYTHING APPEALS. I MUST SAY I LIKE THE LOOKS OF PERMATEK.COM-- ESPECIALLY IF THEY CAN GO 5' UP THE WALL... LOFT? NO LOFT? I TREID TO FIND THE LESSONS ON HOW TO TRAIN THE YUPPY PUPPY-- ROSE DOGGIE POSTED THEM -- CANT FINDE.. ANYWAY I SAID I WOULD GET THESE 3 KITCHEN PUPS TO USE TH EYUPPY... I BETTER GET AT IT.. I M FAILING. HOPEFULLY KAREN IS DUE BACK TOMORROW... A SERVICE DOG WITHOUT THEIR PARTNER.. IS ONE CONFUSED MUTT !! I THINK SHE SAID SHE HAS A FLIGHT TOMORROW... SOMETHING BOUT BUMPING RETIRED MILITARY FROM MILITARY FLIGHTS HAS HELD THEM UP. 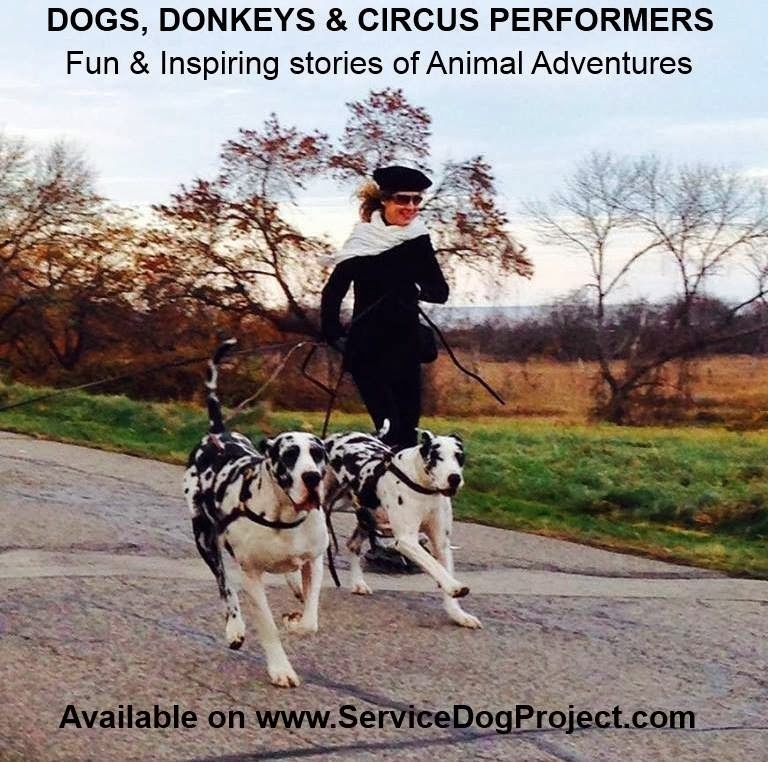 It's too bad more service dog organizations and particularly their board members don't have a better appreciation for the amazing jobs Great Danes are doIng for the mobility impaired. I can't think of another breed that could do better or that is as suitably prepared physically and temperamentally to fulfill those needs. Is there anything I can do or someone I could write to help? Being in Europe without DiDi has reminded me how much freedom she gave me and how dependent on others I am without her. ANNIE DID A NICE MAIL CALL LAST NIGHT- SHE READ A BUNCH OF CARDS AND LETTERS WHILE TEH CP'S AND STAFF KIBITZED. LONG AGO GEORGE SAID WE DEFINETLY NEED A QUARENTINE KENNEL --- MAYBE NOW IS THE TIME? - -- ANNE IS APPLYING FOR GRANT FROM A FAIRLY LOCAL COMPANY, AND IF THEY COME THRU WE JUST MIGHT BE ABLE TO BUILD A PROPER INFIRMARY IN THE PLACE WHERE THE TEEPEE.. NOW IS. WE NEED TO BE ABLE TO SPRAY KENNELS AND SCRUB WALLS AND FLOOR MADE OF CEMENT AND TILE-- NOT PORUS WOOD.. IF ANYONE WANTS TO SUBMIT A DESIGN.. PLEASE DO SEND IT IN THE MAIL.. THE AREA COULD BE 20 X 24-- AND SHOULD CONTAIN PROVISION FOR SCRUB DOWN AND FLOOR DRAINS PLUS MINI LAB WORK - COUNTER SPACE FOR MICROSCOPE AND THINGS. WE ARE DOING THE BEST WE CAN WALKING IN AND OUT OF CHLOROX FOOTBATHS, BUT TEH DEAGLE HOUSE IS STILL PRIMARILY WOOD-- AND YOU JUST CAN NOT CLEAN THAT AS WE WOULD LIKE TO. A THOUGHT FOR THE MOMENT--- SOOO MANY PEOPLE HAVE THANKED US FOR WHAT WE ARE DOING FOR PEOPLE.... WHEN IN MY MIND TEH PEOPLE ARE SECONDARY... THE DOGS ARE HAVING A WONDERFUL TIME- EVERY ONE OF THEM... OF COURSE WE LOOK AT GEORGE--- BUT THERE ARE OVER 100 ALL HAPPILY DOING AN INTERESTING JOB WITH NICE PEOPLE. I WISH THE REST OF ASSISTANCE DOG INTERNATIONAL WOULD REALIZE WHAT FANTASTIC MOBILITY SERVICE DOG A DANE MAKES---- ESPECIALLY IF THE PERSON DOES NOT NEED TO HAVE THE DOG RETRIEVE SOME OBJECT... THERE ARE DOGS BETTER AT RETREIVING NO DOUBT-- AND A JACK RUSSEL MAKES A BETTER "HEARING EAR" DOG TO ALERT TO SOUNDS.. BUT WHEN IT COMES TO WALKING AROUND A DANE IS "WHERE IT IS AT" . Long shapes like a mouse! WE STILL HAVE A HUGE BOULDER ROLLING DOWN HILL AT US WITH THIS LOOSE STOOL BIT..
ALL THE GROUND WATER IN NEW ENGLAND IS CONTAMINATED SO I AM TOLD. VARIETY OF COLORS BROWN , GREY, YELLOW. THAT MEANS TROUBLE FASTER THAN ANY OTHER. I CAN'T REMEMBER THE VOMIT REPORT..
YOU CAN ADD BENTLEY AND DIDI TO THE RAINBOW DIVISION... WITH TAN AND YELLOW. MORE QUICKLY THAN PUPS... OR ANY DOG ALREADY COMPROMISED BY SOME OTHER PROBLEM. ON THINGS LIKE EBOLA--- THING 2 IS A NURSE...IS THIS GOLDIE PRESENTING US WITH A GIFT? BUT THANKFULLY WE HAVE GOOD SOLID ONE EACH OF THOSE. I have recently seen the video and news reports on Bella and George. Congratulations on the great work you do. I understand that your service is for those living in the northeastern United States. Could you please recommend an organization in the Midwest that can help provide and/or train service dogs for mobility issues similar to the situation Bella experiences? I have a child who has issues in her legs and in her armst similar to cerebral palsy. They have determined that it is not a form of CP but have not been able to find an actual diagnosis. She can walk on her own but with an irregular gait. Her tight, spastic muscles and balance difficulties are her only issues. A large service dog such as a Great Dane would be a great help, allowing her to walk with support and confidence and reduce her fear of falling. i keep telling them to contact ADI in their area.. but i don't think any other adi member has danes--tho hopefully now- they are considering it. we do have a nice female in florida with new horizons ZENA -- i hear they are thinking of breedin her to a lab ( for thier own mental security)----- lu ( ECAD in conn) bred a dane to a lab and got a bunch of high strung large labs-- she gave us one.... and i an sure it was not my predispsoition about labs... but the dog was very high maintanience aNd we gave it to someone way up in maine as a pet. it lacked all the good things about a dane. IN THE PROCESS THERESA LOST HER DESK CHAIR-- I SAW THAT GRACE WAS SITTING ON AN OVERTURNED LAUNDRY TUB- SO SCOOTED OUT THERESA'S CHAIR..
.PLEASE DON'T SEND ANY--- AT ONE POINT IN MY LIFE I BOUGHT 8 OFFICE CHAIRS AT A FLEA MARKET.. AND THEY ARE IN THE WAY IN THE TRAINING ROOM. SPEAKING OF SENDING THINGS-- LAST NIGHT.. THE MIC WAS ON WHEN I CALLED IN A DINNER ORDER FOR 6 OF US.... WHEN THEY DELIVERED IT, THEY TOLD ME REGINA -- FROM GEORGIA HAD PAID FOR IT ALL... WOW !!!! WHAT A HAPPY SURPRISE !!! SHE WAS ONE OF THE FIREBUILDERS FROM DOGFEST. GREAT MYSTERY AS TO HOW SHE KNEW WHICH RESTAURANT AS THIS IS ONLY THE SECOND TIME WE ORDERED FROM THEM--- WHAT DID SHE DO??? WATCH ME DIAL??? ?/ THESE CAMERA PEOPLE DON'T MISS THING. CP'S IHEART AND CHARLOTTE HAVE US WELL STOCKED WITH A COMPLETE HAM DINNER. I WILL DO A LAST MINUTE RUN TO COSTCO FOR CHLOROX AND SALAD. HOPEFULLY THE 6' PLOW FROM STREET TO BARN WILL GIVE US A WAY TO GET STAFF AND VOLUNTEERS IN HERE TO HELP-- TEHN I CAN CLEAN UP WITH THE BUCKET- FOR SILLY THINGS LIKE PARKING. AND THE TRACTOR HAS A WONDERFUL HEATER.... AND DOORS... ONCE IN THE CAB... IT IS ALOT EASIER TO DEAL WITH THAN THE ELECTRONIC MARVELS THAT MAKE MY DAY. are we over whatever hump there was??? bailey already looks 174% better with that lump gone-- which hurt just enough so we could not clean it as we wanted to...she is left with a sizeable hole to heal--- and a tail which may not be lifted more than an inch or two...we may leave a poland springs soapy water bottle or two ( relabeled) next to the door to help her remain socially acceptable- small price to pay...all those small white washcloths you sent for the birthing will be put to good use. i should update the amazon list- i will in fact--- we could use some vasoline impregnated gauze strips-- and we are nearly out of vet wrap... and i must order more vaccines. the parvo test came back negative-- between labs making mistakes and the "NO" really meaning they did not see any in that sample....i don't believe it...and we are acting around here as if we possibly have a parvo problem. -- foot baths hand washing etc... we have one ppup that is vomiting... but with this number of dogs it is not unusual to always have someone with an upset tummy. i discussed this with geroge- he now has a policy of not giving any treats besides milkbones. he said there are just too many uncontrolled-- so he just cut out all treats- i think that is wise... even the home made ones... so our problem is.... because milkbones has never donated to us--( even tho they brag about donating to service dogs)-- i want to have all milk bone logos... gone. so if you send milkbones, take them out of thier box and put them in a plastic bag- or better yet decorate some other plastic container which would be much more interesting. To every Employee, Worker, and Volunteer at Service Dog Project - young and old. We can’t name names because there are so very many of you - no one more important than another: the dog sitters, pup teachers, kennel cleaners, bill payers, office organizers, grounds keepers, dog trainers, laundry doers, shot givers, volunteer coordinators, mail readers, and master overseer. Poop scoopers all; smiling, encouraging, teaching - all with a common goal, united by love, to prepare these Great Dane dogs for their lives ahead with the people who need them. We did not even know that there were service dogs for people with stability and mobility problems. Our son John, 38, was experiencing the increasing symptoms of his Myotonic Dystrophy. He was becoming bent over, was down to 2 days a week of work, and slowly becoming discouraged and depressed. When someone suggested a service dog, we researched on the web which led us to a visit on a Sunday open house at SDP. There were lots of people, big dogs, lots of food, big dogs, brightly painted buildings and tents, and big dogs. We truthfully didn’t know what to think when we left, but 2 things stood out clearly - the facility was exceptionally clean (didn’t even smell like a dog facility), and the people there were all smiling and obviously loved what they were doing. Fast forward to now. John has been given the gift of Jessie, a svelte and petite 122 pound beautiful Harley (and sometimes drama queen!). It has been 5 months now, and to say it hasn’t been without a lot of work and refocus in our household would not be true. But now John stands tall. His confidence has returned and even grown. He is mentally sharper and clearer than he has been in years. Everywhere John and Jess go people stop them and want to talk. He has had to stop working completely now, but has a reason to get up in the morning and has hope for the future. He has just returned to volunteer at an adult day care with Jessie, where he had volunteered previously, and looks forward to more time visiting nursing homes and schools with his new best friend. None of this would be possible without ALL of you. - EACH ONE - You encouraged us with the paperwork, you encouraged us with the bonding process, you taught us about the care and loving of Danes, you even let (?) us become poop scoopers and kennel cleaners so we could begin to give forward, you helped us with all the little (and sometimes not so little) bumps in the road, you made time in your schedules for training visits, and much much more. ALL WITH SMILES, LOVE , LAUGHING, and ENCOURAGEMENT. So much giving, so much caring, so much love, so much sacrifice. It reminds us this Christmas season of the loving, giving, caring, and especially sacrifice that God gave to us in the gift of His Son, Jesus, whose birth we now celebrate. We are taught that God’s ways are not our ways. We don't understand the tough times, and sometimes we have trouble accepting the good times. Thank you from all the Taylor family. OF COURSE....I AM NERVOUS ABOUT BAILEY... SO DON'T EXPECT MUCH TIL I GET PAST THIS OBSTACLE . SHE IS BETTER THAN SHE HAS BEEN -- THANKS TO GRACE'S CONSTANT CARE.... BUT THIS TAIL THING HAS TO BE DRAGGING HER DOWN...-- OVERNIGHT I THOUGHT OF DIFFERENT SOLUTIONS... ONE OF WHICH WAS CUT THE DANM TAIL OFF... EXCEPT I DON'T THINK WE CAN... THAT IS RIGHT WHERE ALL THE INFECTION HIDES..-- HER TAIL LOOKS DEAD... SHE CAN NOT-- OR WON'T MOVE IT-- IT PROBABLY HURTS SO SHE DOES NOT USE THOSE MUSCLES EVER... SHE IS VERY CLEVER ABOUT PEEING ON A HILL-- BUT SOMETIMES NEEDS A BABY WIPE TO CLEAN HER UP.. WHICH SHE FINDS EMBARRISING. THE OTHER HEALTH ISSUE ----- KRINGLE HAD A TEMP OF 103.4 LAST NIGHT AND DID NOT EAT.-- THAT IS SEMI NORMAL UPSETTING OCCURANCE.. BUT IN LIGHT OF NOT KNOWING WHAT WE ARE DEALING WITH....OUR EARS PERKED UP. AT CRAZY ACRES ----EVEN THO WE HAVE SO MANY DOGS, THERE ARE BUILT IN HEALTH CHECKS HERE--- PRETTY MUCH AT LEAST TWICE DAILY.... SO IF ANYTHING STARTS WE SHOULD BE ON IT WITHIN 14 HOURS. USUALLY THEIR FIRST INDICATION IS LACK OF INTEREST IN FOOD. THE SINGLE DOG FEEDING WITH TEH "WAIT" BIT ALSO GIVES THE FEEDER A CHECK TO SEE IF THERE IS ANYTHING COMING OUT OF ANY FRONT END ORIFICE -NOSE OR EYES- THAT SHOULD NOT BE THERE. AND STANDIN G ON THEIR BACK LEGS IS A QUICK CHECK OF ANY HANGERS THERE AND TEH CONDITION OF THE HIPS..
ANY QUESTION GETS THEIR TEMP TAKEN A COUPLE TIMES A DAY.... DO WE TAKE EVERY DOG EVERY DAY? COURSE NOT.--- MANAGING A BUNCH OF DOGS BECOMES A QUESTION OF WHICH ONES LOOK LIKE THEY DON'T NEED ATTENTION..
WITH THE ABOVE-- AT THE MOMENT- AS OF LAST NIGHT'S FEEDING--- KRINGLE DIDN'T EATSUPPER... BUT SHE HAD EATEN BREAKFAST ---AND GRACE REPORTED AND TOOK THE TEMP 103.4... AND THAT WAS EMAILED TO GEORGE WHO SAID TO BRING HER DOWN TODAY WITH HER MEDICAL RECORD.... - KRINGLE IS IN WITH 2 OTHERS WHO ARE ALREADY EXPOSED TO WHATEVER SO WE LEFT HER THRER OVERNIGHT. THERE ARE 14 IN THAT BUILDING. AND TIL WE GET A BETTER LINE ON WHAT WE HAVE GOING ON - NO DOGS ARE MOVING THERI LIVING QUARTERS... NORMALLY WE SHIFT DOGS FROM BUILDING TO BUILDING ON A DAILY BASIS FOR VARIETY'S SAKE. I HAVE ADDED... FOR THE MOMENT WE HAVE INSTITUTED A NOISE ASSESSMENT DEPT. STETHOSCOPES TO STEVE AND GRACE-- GRACE BEING AN RN IS OUR PROFESSIONAL HEAR-ER- STEVE IS TO ASK GRACES OPINION IF HE FINDS ANY NOISES HE DOES NOT UNDERSTAND.- IF GRACE REPORTS ANY...WE TAKE TEMP AND ASK GEORGE. STOOL REPORTS ARE DIFFICULT WHEN THEY ARE 2-3 OR 4 IN A KENNEL-- OR THE KITCHEN.-----.BY SEPARATING THEM WE CAN FIGURE OUT WHICH IS THE PENDING POO PROBLEM...-- OR BETTER YET.. THE CAMERA PEOPLE NOITCE AND LET US KNOW. he was a great guy... we did give him a happy life, but the past few days his happiness was clearly over. whatever it was , i wIll report the details as they come in from the lab tests. PLEASE... ON WE GO WITH THIS-- CAN YOU ALL WATCH THIS AND PASS IT AROUND ASKING EVERYONE TO SHARE ETC....GET THOSE NUMBERS UP ! !